What are a hotel’s energy costs per room? And how can hoteliers better control those costs without inconveniencing guests or asking them to cut back on their energy usage? Occupancy sensing is becoming a more popular answer to these questions. This guest-detecting technology comes in several forms—motion detection, thermal occupancy sensors, and network presence sensing, to name a few—and each uses a different method to determine human presence. With that information, hotels can save on operational costs when areas are empty by automatically shutting off lights and adjusting temperatures. The technology also enables hotels to enhance and personalize the guest experience by remembering guest preferences and automatically setting rooms to meet those specifications. Yani Deros is the CEO and co-founder of CIRQ+, a low-footprint, modular IoT solution that retrofits into any guest-room to convert it into a smart room. 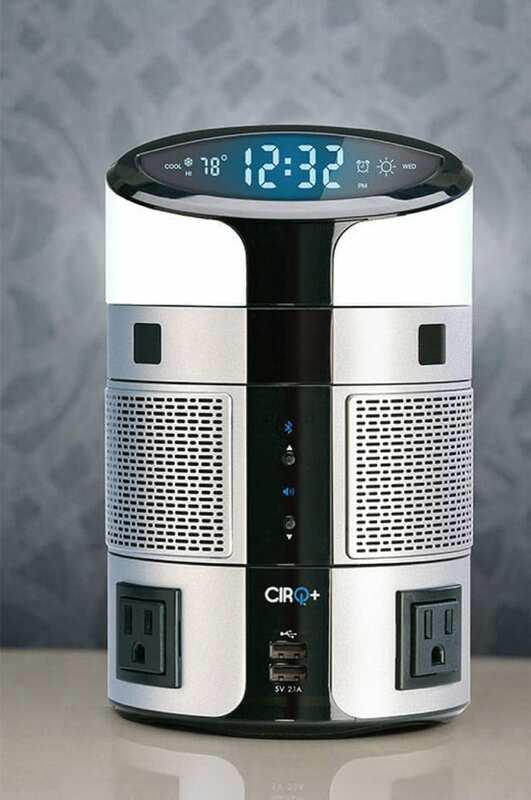 At this year’s HITEC, Deros told LODGING about how CIRQ+ consolidates several features of a smart room into its modular, bedside system—from USB charging ports and a Bluetooth speaker to wireless thermostat controls. Wireless protocols (i.e., WiFi, ZigBee, and Zwave) ensure that CIRQ+ covers and connects the entire room’s light switches, plugs, light bulbs, and other edge devices. The system also incorporates thermal occupancy sensors, which hoteliers can use to determine whether someone is in the room and adjust temperatures accordingly, Deros explains. “If you talk to any hotel and ask, ‘How much energy do you spend per room,’ nobody has any clue. They get one bill at the end of the month, they pay it, and that’s it,” Deros says. His company offers a monthly, per-room subscription model that helps hoteliers track occupancy and energy use per room and either set or rollback temperatures for greater savings. The system can also integrate with a hotel’s PMS to collect operational data and track guest preferences. Evidence suggests that guests support these efforts to cut energy usage. Deros’ company recently conducted a national research study involving 1,000 travelers to learn about their habits, needs, and technology adoption. What they found is that travelers care about their environmental impact. “The majority of people want to make a difference from an environmental standpoint, so they want to use less energy. They’re happy to pass that savings on, but they also feel that if they’re going to save the hotel money, it should also have an impact on the rate,” Deros explained. Because this cost-cutting solution benefits both guests and owners, hotels are rapidly adopting this kind of technology. Sinclair Holdings recently announced that it would implement network presence sensing (NPS) technology by Ivani in The Sinclair, a Marriott Autograph Collection hotel opening in February 2019. The NPS system—which feeds advanced occupancy data to various building systems to improve occupant experiences and save operational expenses— will be integrated into NuLEDs’ Power-over-Ethernet (PoE) lighting system to connect building control systems. The NPS system operates on Bluetooth devices, which are part of the NuLEDs lighting system, and NPS firmware is installed on those Bluetooth devices, allowing groups of them to act as advanced occupancy sensing systems. Ivani’s NPS firmware and software uses algorithms and machine learning to provide information about human activity in a space through analysis of wireless communications without requiring the occupant to carry a smartphone, tag, or another beacon. Ultimately, the technology provides opportunities for building owners to enhance the system over time with data and by crafting future experiences for guests, all without needing to physically change the installed devices. The technology’s data classes include change detection for advanced motion sensing, presence detection for true occupancy sensing, people counting for occupancy level, and people locating for heat mapping. Hotels can use these data classes for applications like advanced lighting control, improved HVAC efficiency, and building security.